Oh God, please don’t let me fall into the sky! I have a confession to make. I have a deep-seated horror of wide-open spaces that when it strikes causes me palpitations, a sensation of overwhelming vertigo and an almost irresistible urge to grab onto something solid for dear life or go hide underground somewhere. My fear is that perhaps gravity might decide to invert itself for no good reason and with nothing to stop me, I’ll plummet without end into space. Yes, I’m aware this is completely irrational but no matter how much I reassure myself that the laws of physics are immutable, the panic still comes. I can trace this bizarre fear back to when I was 6 years old and first watched The Empire Strikes Back. I was struck with acute anxiety over the newly one-handed Luke Skywalker’s plight as he dangled in the sky from a pylon at the base of Cloud city. This unease about the sky was later compounded by episode 56 of the 1986 Defenders of the Earth animated TV series. The Necklace of Oros contains an extended scene where Ming the Merciless inverts Earth’s gravity and gleefully shows people screaming as they fall into the abyssal blue sky. American pop culture has scarred me for life. Perhaps I thought I was safe with anime. Having now survived Patema Inverted, I thought wrong. Image: Fox. Or now Disney. Whatever. Never before has an anime movie provoked me to clutch onto the edge of my sofa for dear life. That must surely speak something for the artistic mastery of space demonstrated by the design and direction of this gorgeous film. I think my wife must have bought this as a cruel joke, she was fully aware of what the film was about when she gave me the Blu-ray for Christmas last year. I only recently mustered the courage to watch it. I first heard of Patema Inverted when it won both the Audience Award and the Judges Award at the 2013 Scotland Loves Anime film festival. The concept both intrigued and horrified me - a love story between two teenagers, one whose gravity keeps him on the ground, the other whose gravity pulls her towards the dreaded sky. Despite my perpetually churning stomach and vertiginous lurchings, I thoroughly enjoyed Patema Inverted. What persists in my memory now are the sudden scene inversions from one character’s viewpoint to the other’s. The director (Yasuhiro Yoshiura - Time of Eve) himself explains in an interview on the disc that his intention was to demonstrate how with just a simple perspective change, how a seemingly innocuous environment could suddenly become terrifying and life threatening. Oh boy, did I get that. Those scenes were without exception beautifully staged and dramatically effective. Sequences with the characters falling into the open sky were breathtaking with dramatic cloud formations and kinetic movement. When the main characters discover that their weights almost-but-not-quite offset the other’s, there follows a sequence of pure unadulterated joy as the two moon-jump across the landscape in one of the movie’s best parts. 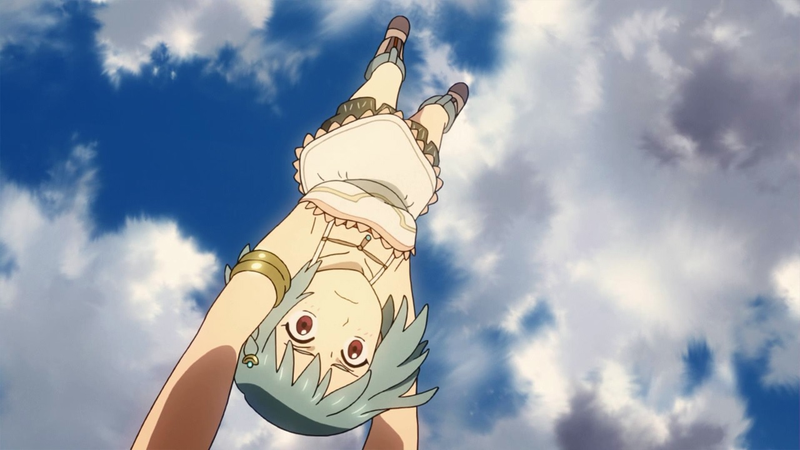 Patema Inverted is not merely eye candy. The co-protagonists are nicely drawn and sympathetic. The titular Patema is a typical cute, perky, energetic anime heroine who feels constrained by her compact underground environment and longs to seek out “new worlds” despite her elders discouraging her from doing so. In design she resembles something of a cross between a messier-haired Eureka 7 and Nausicaa. At times a damsel in distress, at other times the one doing the saving, she’s a magnetic main character. Age (pronounced Eiji) looks like a more generic everyman anime teen. He’s a daydreamer always looking towards the sky, which is taboo in his tightly controlled, regimented surface society. Not-so-subtle visual allegories abound in his city - like the automated walkways that funnel students single file towards the educational institutes where they rote-learn to earn enough points to become acceptable citizens/mindless drones. It’s no coincidence that partway through the film he sets off on his own path against the flow. His very human empathy and inquisitiveness are harder for society to control, so of course he becomes a focus for some quite heavy-handed fascist-style oppression. That leads me to the only real problem I had with the movie - the main antagonist Izamura who doesn’t wear jackboots and a peaked cap, but might as well do so. He’s a ridiculously cartoon villain with no redeeming features whatsoever and no real motivation to be as horrible as he is other than his deeply-held religious ideology that the gravitationally inverted people are somehow “sinners”. As a boo-hiss bad guy he’s pretty effective, but in the end I did wonder what the point of his single-minded pursuit of the main characters was. His treatment of Patema was particularly cruel - making her sleep at the pinnacle of a tower in a glass-domed ceiling, from her perspective dangling over an infinite abyss. That made me shudder. Izamura gives off more than a little “Judge Frollo” (Hunchback of Notre Dame - Disney version) vibe. Creepy. The plot itself is quite simple: boy meets girl, boy loses girl and attempts to save her, high-stakes action ensues, the drama resolves. What is fascinating about this movie is how it achieves that resolution. Without venturing too far into spoiler territory (this film is best viewed as unspoiled as possible), the final third of the film works to invert everything that has gone before. It does this with barely a word of dialogue to explain it - the epitome of showing not telling. I watched the standard blu-ray version of this release, though there are some nice extras on the disc - some interviews, trailers and an opportunity to watch the movie “inverted” with alternate angles from the upside-down characters viewpoints. Even the text on the back of the case sleeve is upside-down, which was a nice touch. A more expensive Ultimate edition was also released but seems to be out of print, which is a shame as it contains a 136-page design works book and a 48-page short story booklet.